Diana Madera, winner of the John Bahcall Award. Photo by C. Lagattuta. One of the top physics students in Mexico is spending this summer studying astrophysics at the University of California, Santa Cruz, as the first winner of the John Bahcall Award. Diana Madera, an undergraduate at Universidad Autónoma de Zacatecas, won a national competition for the award, which was established by Enrico Ramirez-Ruiz, assistant professor of astronomy and astrophysics at UCSC, to honor his mentor, the late John Bahcall. Bahcall, who died in 2005, was an eminent astrophysicist at the Institute for Advanced Study in Princeton, N.J., where Ramirez-Ruiz did postdoctoral research from 2003 to 2006. 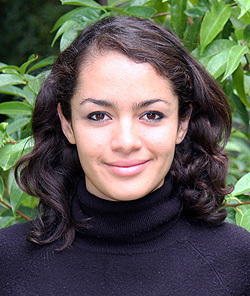 Ramirez-Ruiz was the first recipient of the John Bahcall Fellowship, established after Bahcall's death to support outstanding postdoctoral scholars at the institute. During his long and prolific career, Bahcall was known not only for important scientific contributions and influential leadership of the astrophysics community, but also for nurturing the careers of hundreds of promising young scientists. "This award is a tribute to John Bahcall's achievements, to his love of science and his colleagues, and to his high standards of excellence in research," Ramirez-Ruiz said. "He and his wife Neta were very kind to me and my family, and what stands out in my personal memories of John are not only his intense love for science but also his generous personal interactions and inspiring physics discussions with me and other scientists." Neta Bahcall, the Eugene Higgins Professor of Astrophysics at Princeton University, said that when Ramirez-Ruiz described his idea for the award to her, she thought it was a wonderful idea. "It is very fitting to connect it with John's name because he loved to help young scientists in their educations and launch them into outstanding careers in science," she said. "He would be proud to know that young physics students are benefiting from an award in his name." The award supports an outstanding undergraduate physics student from Mexico for an eight-week research internship at UC Santa Cruz. Madera has been working with Ramirez-Ruiz and UCSC graduate student Rachel Strickler to study stars that end their lives in spectacular explosions known as type 1a supernovae. The project involves searching archived observations of nearby galaxies where supernovae have occurred to find earlier images of the explosion sites. "It is an honor to be the first recipient of the John Bahcall Award, and I cannot express enough how thankful I am for all that my mentors here at Santa Cruz have done to help me realize my full potential," Madera said. The Bahcall Award is similar to the Leon Lederman Award, which Ramirez-Ruiz won in 1997 as an undergraduate at Universidad Nacional Autónoma de Mexico in Mexico City. The Lederman Award enabled him to study astrophysics at Los Alamos National Laboratory. He went on to earn a Ph.D. in astronomy and astrophysics at the University of Cambridge, after which Bahcall recruited him for a postdoctoral position at the Institute for Advanced Study. Ramirez-Ruiz is funding the Bahcall Award in part with money from a Packard Fellowship in Science and Engineering, which he won last year. Additional funding was provided by an anonymous donor. Fundacion Hertel, a nonprofit organization for the advancement of physics in Mexico, oversees a national competition leading to the selection of the winners of both the Lederman and Bahcall awards.